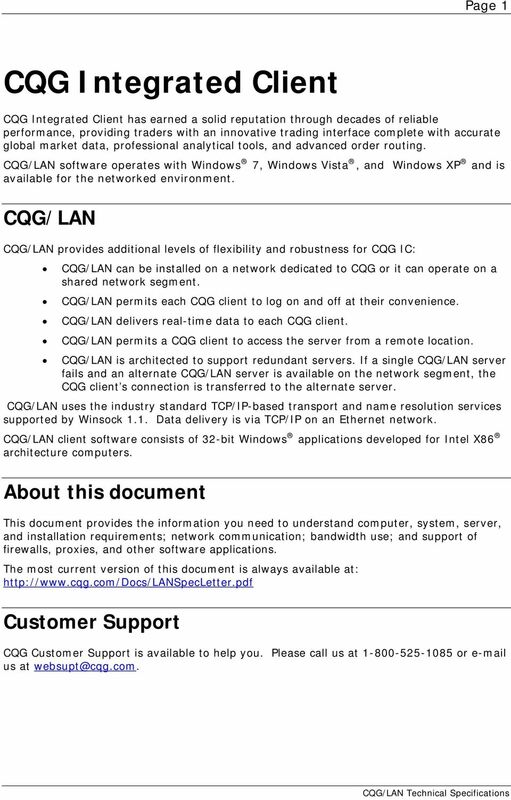 Download "CQG/LAN Technical Specifications. January 3, 2011 Version 2011-01"
2 Copyright 2011 CQG Inc. All rights reserved. Information in this document is subject to change without notice. Windows XP, Windows Vista, Windows 7, Windows, ActiveX, Excel, and Visual Basic are either registered trademarks or trademarks of Microsoft Corporation in the United States and/or other countries. 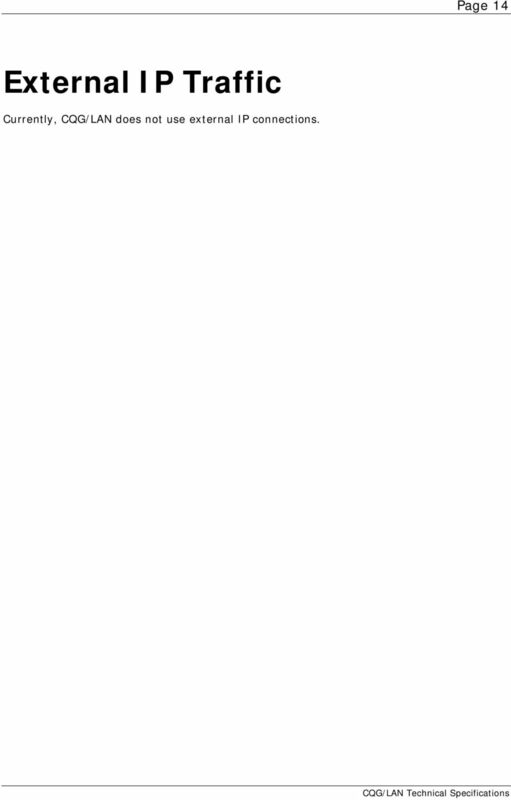 Intel is a trademark of Intel Corporation in the U.S. and other countries. 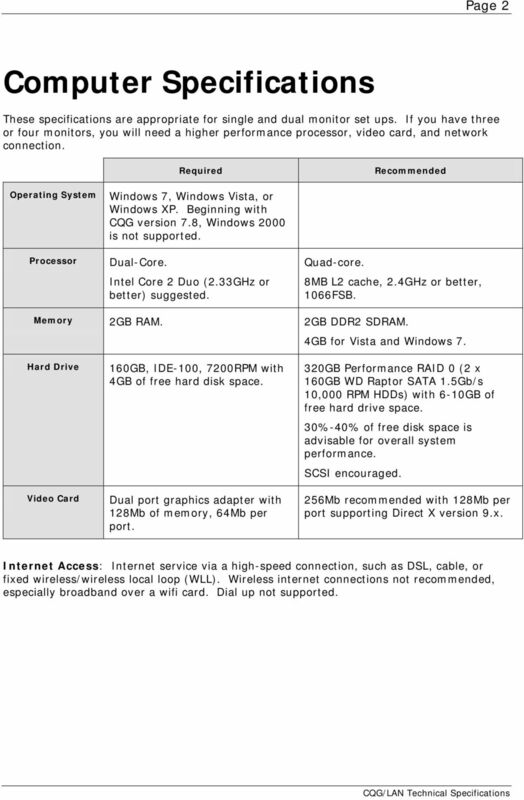 5 Page 2 Computer Specifications These specifications are appropriate for single and dual monitor set ups. If you have three or four monitors, you will need a higher performance processor, video card, and network connection. Required Recommended Operating System Processor Windows 7, Windows Vista, or Windows XP. Beginning with CQG version 7.8, Windows 2000 is not supported. Dual-Core. Intel Core 2 Duo (2.33GHz or better) suggested. Quad-core. 8MB L2 cache, 2.4GHz or better, 1066FSB. Memory 2GB RAM. 2GB DDR2 SDRAM. 4GB for Vista and Windows 7. Hard Drive Video Card 160GB, IDE-100, 7200RPM with 4GB of free hard disk space. Dual port graphics adapter with 128Mb of memory, 64Mb per port. 320GB Performance RAID 0 (2 x 160GB WD Raptor SATA 1.5Gb/s 10,000 RPM HDDs) with 6-10GB of free hard drive space. 30%-40% of free disk space is advisable for overall system performance. SCSI encouraged. 256Mb recommended with 128Mb per port supporting Direct X version 9.x. Internet Access: Internet service via a high-speed connection, such as DSL, cable, or fixed wireless/wireless local loop (WLL). Wireless internet connections not recommended, especially broadband over a wifi card. Dial up not supported. 6 Page 3 System Setting Requirements Hibernate and standby modes cannot be used on a system running the CQG client. Hard drive power-saving features should also be disabled. 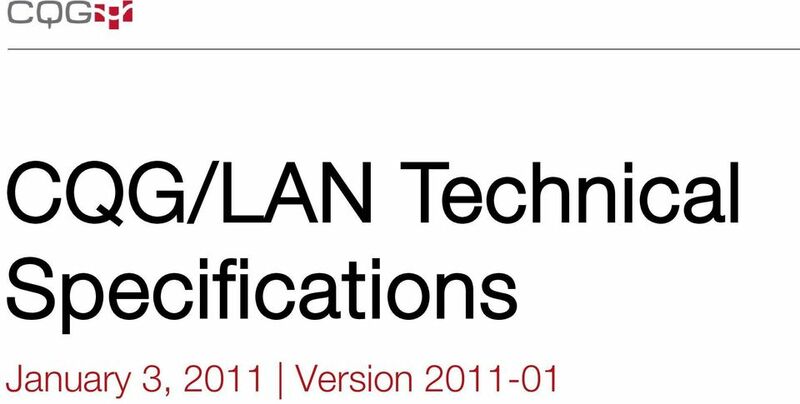 7 Page 4 Bandwidth Utilization CQG/LAN requires approximately 1K bytes/sec sustained and an average 2K bytes/sec of additional bandwidth for burst mode access per user or approximately 0.03% of the 100Mbit Ethernet bandwidth per user. Because Ethernet performance degrades significantly when the network load exceeds 30%, the number of CQG clients per network segment should be limited to 60, given a normal distribution of quotes-only and technical analysis users. CQG would then consume approximately 2% of the available bandwidth, leaving sufficient reserve capacity for other network functionality. Task Duration Bandwidth Usage Startup Short burst < 1 sec kbps sec 3-5 kbps avg Page change uncached, first time viewed Page change cached, already viewed Page viewing Short burst < 1 sec Short burst < 1 sec As long as page is displayed on screen 5-30 kbps depending on page complexity 1-3 kbps 1-3 kbps avg sustained Typical 10-min session including startup, shutdown, and multiple page changes 10 min 2-3 kbps avg CQG Multiple Monitor Services CQG offers Dual Monitor Service, Triple Monitor Service, or Quad Monitor Service. Each additional monitor adds an additional amount of bandwidth usage, approximately equal to the figures shown in the above table. 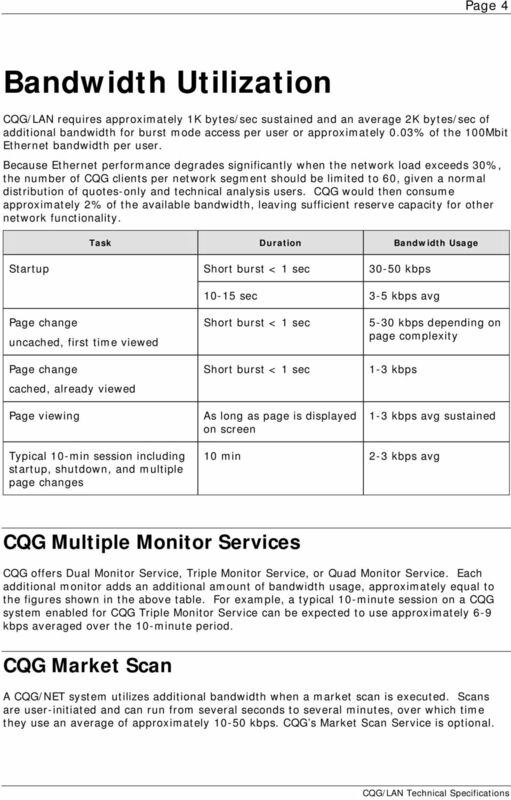 For example, a typical 10-minute session on a CQG system enabled for CQG Triple Monitor Service can be expected to use approximately 6-9 kbps averaged over the 10-minute period. CQG Market Scan A CQG/NET system utilizes additional bandwidth when a market scan is executed. Scans are user-initiated and can run from several seconds to several minutes, over which time they use an average of approximately kbps. CQG s Market Scan Service is optional. 8 Page 5 Firewalls and Proxies Firewalls CQG/LAN supports the following firewall configurations: Network address translation Dynamically assigned ports on the client side Proxies Socks 4 and 5 proxies are supported as well as a Winsock redirector, such as Microsoft Proxy Server 2.0. 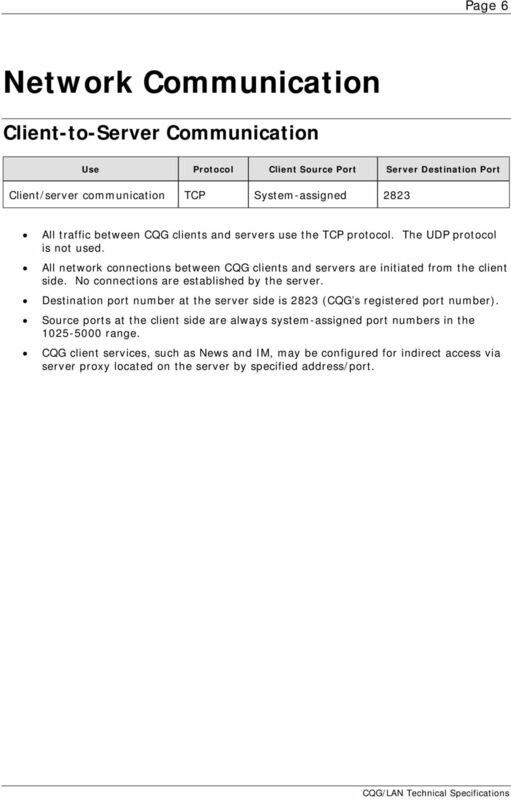 9 Page 6 Network Communication Client-to-Server Communication Use Protocol Client Source Port Server Destination Port Client/server communication TCP System-assigned 2823 All traffic between CQG clients and servers use the TCP protocol. The UDP protocol is not used. All network connections between CQG clients and servers are initiated from the client side. 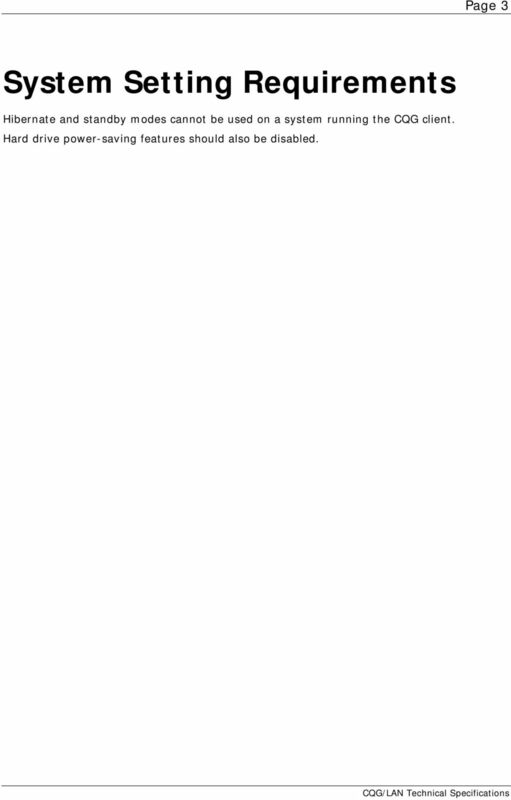 No connections are established by the server. Destination port number at the server side is 2823 (CQG s registered port number). Source ports at the client side are always system-assigned port numbers in the range. CQG client services, such as News and IM, may be configured for indirect access via server proxy located on the server by specified address/port. 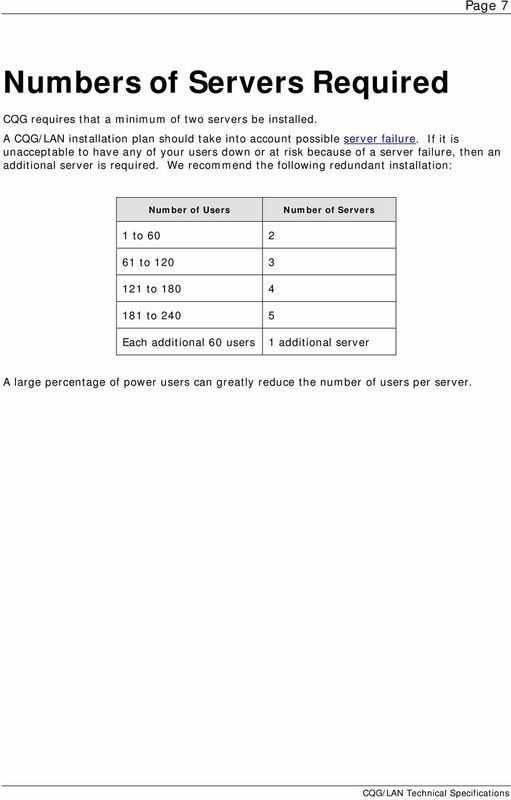 10 Page 7 Numbers of Servers Required CQG requires that a minimum of two servers be installed. 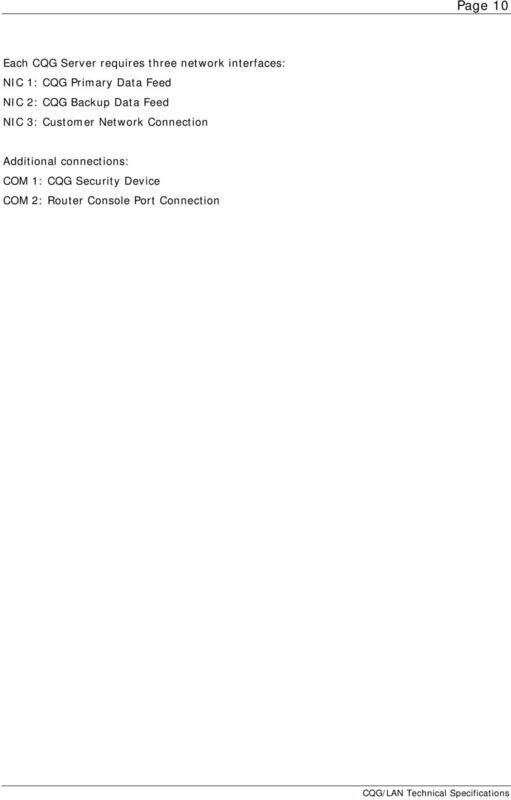 A CQG/LAN installation plan should take into account possible server failure. If it is unacceptable to have any of your users down or at risk because of a server failure, then an additional server is required. We recommend the following redundant installation: Number of Users Number of Servers 1 to to to to Each additional 60 users 1 additional server A large percentage of power users can greatly reduce the number of users per server. 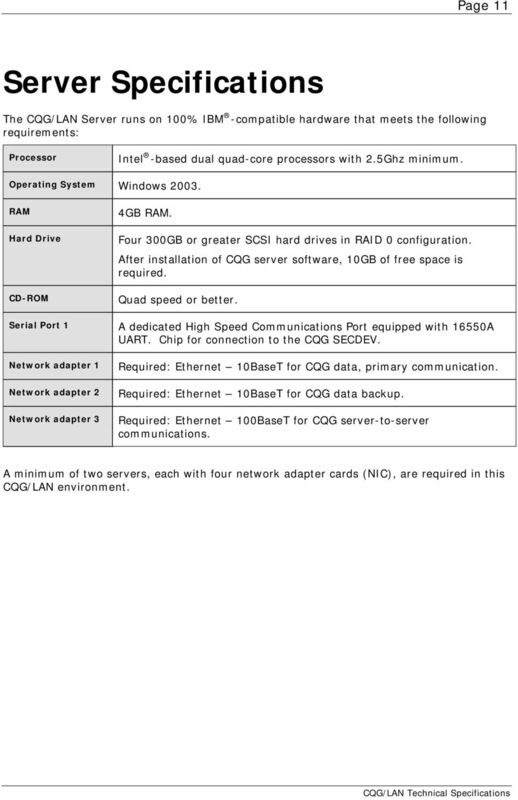 14 Page 11 Server Specifications The CQG/LAN Server runs on 100% IBM -compatible hardware that meets the following requirements: Processor Intel -based dual quad-core processors with 2.5Ghz minimum. Operating System Windows RAM Hard Drive CD-ROM Serial Port 1 Network adapter 1 Network adapter 2 Network adapter 3 4GB RAM. Four 300GB or greater SCSI hard drives in RAID 0 configuration. After installation of CQG server software, 10GB of free space is required. Quad speed or better. A dedicated High Speed Communications Port equipped with 16550A UART. Chip for connection to the CQG SECDEV. Required: Ethernet 10BaseT for CQG data, primary communication. Required: Ethernet 10BaseT for CQG data backup. Required: Ethernet 100BaseT for CQG server-to-server communications. A minimum of two servers, each with four network adapter cards (NIC), are required in this CQG/LAN environment. 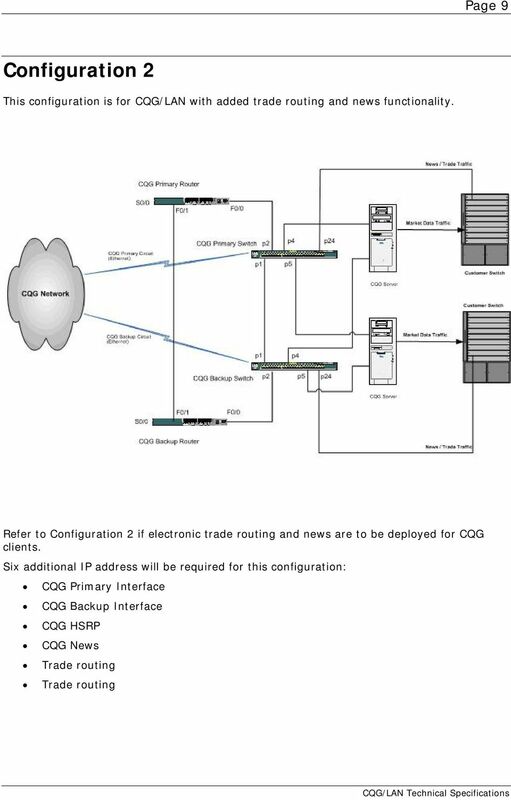 15 Page 12 Dealing with Server Failure CQG/LAN is architected for robustness through symmetrical redundancy. Each server is capable of performing every system function, including acting as the active login server. Failover is triggered automatically when critical inter-server communications are interrupted for longer than the permitted time-outs. If one CQG/LAN server fails, the CQG client s connection is automatically transferred to another CQG/LAN server, guaranteeing uninterrupted access to market data. 16 Page 13 CQG/LAN and Market Data CQG broadcasts market data to CQG/LAN servers using IP multicast communications over a dedicated leased line. 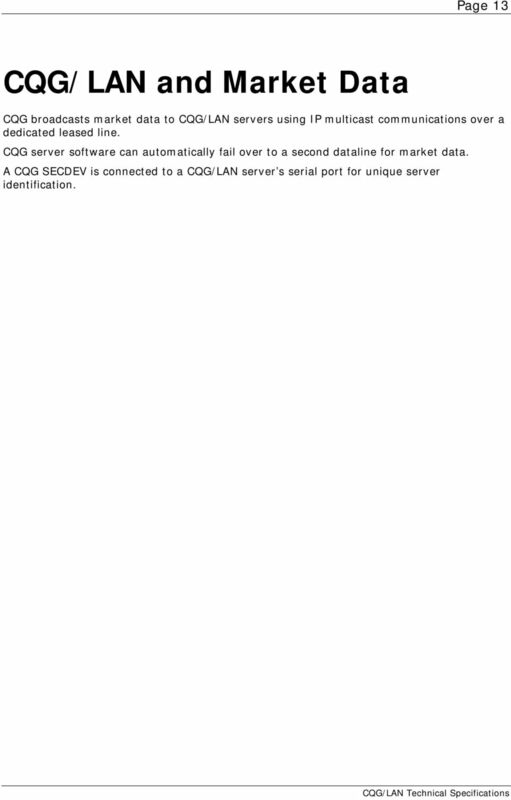 CQG server software can automatically fail over to a second dataline for market data. A CQG SECDEV is connected to a CQG/LAN server s serial port for unique server identification. 17 Page 14 External IP Traffic Currently, CQG/LAN does not use external IP connections. 18 Page 15 Installation Because CQG/NET is a real-time, mission-critical application, we recommend that it and the working directory be loaded on a local hard drive. For best performance, we recommend setting the working directory to a file server and not running CQG/LAN from an application server. User-modified files are backed up daily by CQG. You must register COM and ActiveX components on the client system and install mdac 2.7 or higher and Microsoft.net framework 2.0 or higher. IMPORTANT: User permissions on the main CQG folder and all subfolders and files must be set to Modify or Full Control. Installing the CQG client application on a restricted drive and assigning it limited permissions, such as Read & Execute, impede performance and may prevent CQG/LAN from functioning at all. 19 Page 16 File Server A file server is recommended for storing unique configuration information about and for each CQG client. The file server needs to provide access permission for the creation of new private directories for new CQG clients. Network traffic is negligible. The file server must be accessible on the client side of a firewall. It is of utmost importance that a routine file backup policy is in place on the file server. 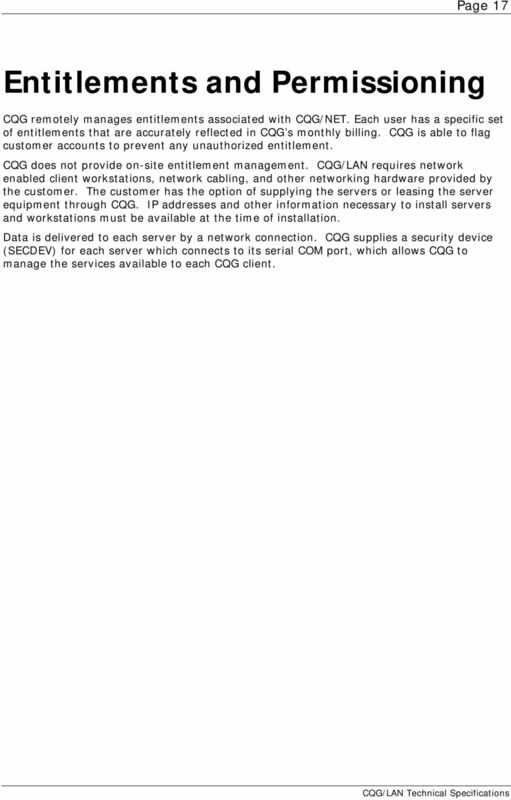 20 Page 17 Entitlements and Permissioning CQG remotely manages entitlements associated with CQG/NET. Each user has a specific set of entitlements that are accurately reflected in CQG s monthly billing. CQG is able to flag customer accounts to prevent any unauthorized entitlement. CQG does not provide on-site entitlement management. CQG/LAN requires network enabled client workstations, network cabling, and other networking hardware provided by the customer. The customer has the option of supplying the servers or leasing the server equipment through CQG. IP addresses and other information necessary to install servers and workstations must be available at the time of installation. Data is delivered to each server by a network connection. 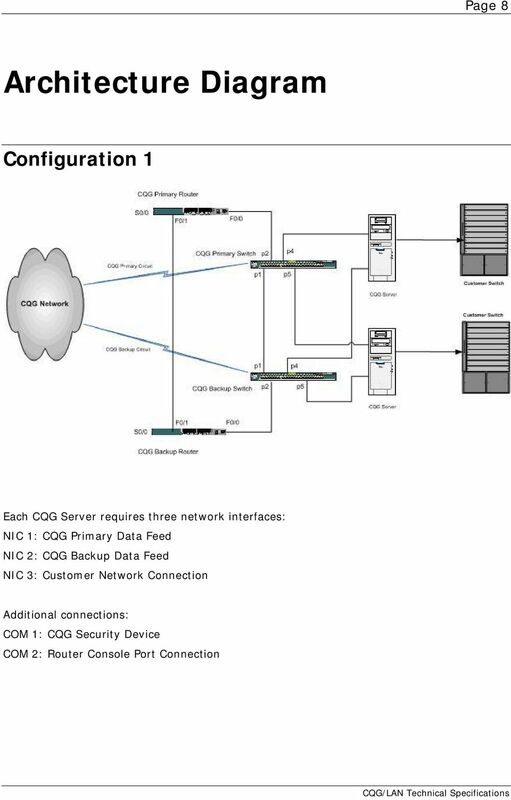 CQG supplies a security device (SECDEV) for each server which connects to its serial COM port, which allows CQG to manage the services available to each CQG client. 21 Page 18 Client Load Leveling When a CQG client logs on to a CQG/LAN server cluster, the active login server allocates the client to the CQG/LAN data server with the fewest users. 22 Page 19 CQG/LAN and Other Applications The CQG client is DDE-compliant and can provide data to software such as Excel and Visual Basic. CQG does not publish its data feed for general price databases. Before deploying SiteAudit it is recommended to review the information below. This will ensure efficient installation and operation of SiteAudit.